Todd: Phil, you said you're a teacher. Did you study education in college? Phil: No, actually, I studied engineering in college. Phil: Yeah, I was an automotive when I was younger. Phil: It was really interesting a job really exciting but I kind of came into teaching to try something different and to maybe gain confindence in myself as well. Todd: So if you're an engineer then you must like gadgets, right? Phil: Oh, yeah, I love gadgets. I got many in my room. Todd: So what kind of gadgets to you have? Phil: Well, my favorite has to be my laptop computer of course. I think everyone should have a laptop now because it's complete entertainment. I can watch movies. I can download music from the internet. I can write reports on my students. I can research new games on the internet. I can do anything in the world on my laptop. It's just amazing what you can do. Todd: So you talk about downloading things. Like you must have an MP3 player or ipod. Phil: I've got an ipod as well, yeah. I love my ipod. Everyday I listen to music. Music is one of my main passions in life and I particularly like rock music and scar punk as well, so I download bands from all over the world on the internet that maybe ten years ago nobody would have been able to find information about, so I think things like ipod have opened up the world of music to everyone. Todd: Right. Right No, I agree. Actually, I have an MP3 player and an ipod and I use them all the time. Todd: So, you're really into your laptop. You're really into your ipod. Any other gadgets that you really like? Phil: I suppose I have to say my digital camera. When I was younger, I was absolutely useless at taking photographs - well I still am absolutely useless at taking photographs. I always manage to miss the main part of the picture or the thing I'm aiming for. Once I get the lighting composition completely wrong. So with a digital camera, I can choose the photos I want and I can keep retaking them until I know I got the one I actually want, and then on my computer, back to my laptop again, I can edit the photos until they look exactly like I want them to, so digital camera is amazing for me. Todd: Yeah, I agree, like I use cameras a lot for the website and I couldn't make it without them. 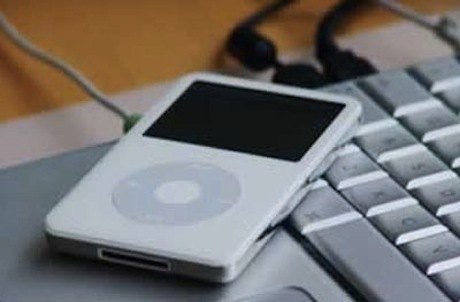 Phil: Yeah, it's amazing how in the last ten years things have changed so much, like we said with the ipod earlier, I used to have a cassette player when I was younger. Phil : It was huge, and it was like taking a brick with me everywhere I went, and not the ipod just fits in my pocket and I don't even know it's there. It's amazing the difference. Todd: Yeah, I listen to the podcasts on the way to work and it makes my train commute so much more enjoyable. Todd : Right, right. OK, thanks a lot Phil. I kind of came into teaching to try something different. I came into journalism quite late, as it is my second career. Why don't you come into teaching? You have all the skills that you need. Phil says he went into teaching to gain confidence in himself. When you 'gain confidence,' it means that you increase your belief in your own abilities. I hope to gain confidence in my singing if I practice more. If you socialize more then you will gain confidence. Music is one of my main passions in life. Your 'main passion' is the thing that you love the most. My main passion is food, I really love to cook. One of her main passions is her children, she puts them before anything else. I was absolutely useless at taking photographs. When you are 'absolutely useless' at something, it means that you cannot do it very well or at all. I am absolutely useless at running. I don't think I will pass my exam, as I am absolutely useless at French. It's like keeping in touch with the rest of the world. 'Keeping in touch' means that you remain in contact with someone. When you move away, please make sure that you keep in touch and write to me lots. He promised to keep in touch with me, but he never wrote. Doing practice interviews will help you gain in your abilities. I can't believe he planned this event. I assumed he was completely at planning. We kept for a few years after university, but I haven't heard from him in years. I'm not quite sure how I advertising, but I love it. Music is one of his main .